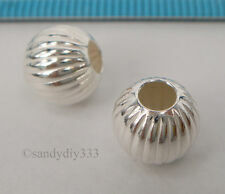 2 pcs x BRIGHT STERLING SILVER CORRUGATED ROUND BEADS. Made of solid Sterling Silver. Materials Alloy. Mainly Color. Approx Size. Shape: Open Jump Ring. Color: Silver Plated. Size: 9mm x 1.2mm. 6 months after the parcel was sent. Shape: Round Flower / Quatrefoil / Shamrock. Color: Antique Bronze Tone. 6 months after the parcel was sent. Shape: Eiffel Tower. Color: Antique Silver Tone. 6 months after the parcel was sent. Color: Matte Silver Tone. 6 months after the parcel was sent. 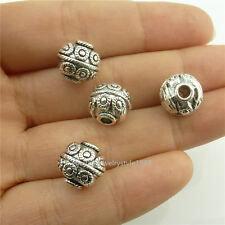 ♥ 12pcs Antique Silver Tone Round Spiral Snail Sea Shell Seashell Marine Flat Beads Two Sided 9mm x 4mm. Shape: Round Spiral Snail Sea Shell Seashell Marine Flat Beads Two Sided Bohemian Findings. Color: Antique Silver Tone. 4x9mm Hole goes from side to side. Design on both sides. *Please consider the actual sizes given in the listing as the pictures are generally enlarged to show detail. .
10 piece Pearl of beads 8 mm. COLOUR SILVER. 10 units - 8 mm. Round Rivet Studs. Spots Rock. Bead Craft. Round Rivet Studs. 144 - Pieces. Spots Rock. Round Rivet Studs. Spots Rock. 120 Pieces. Padre Beads. Bone Beads. Copper Beads. Tiger Eye Beads. These artisan beads are highly versatile and make for great accent pieces in bracelets and necklaces. Using these beads will add a unique and natural looking flair to your masterfully crafted jewelry designs. The Yoruba people are known for their vibrant cultural traditions and exceptional handiwork. Beautiful beads for your custom jewelry creations. Multiple strands pictured. Each strand sold individually. ANTIQUE CIRCLED LOVE. STOP LOCK CLIP END BEADS. 3.5 mm SILVER CORE ~ NEW. CIGAR BOXES, BEAUTY & HEALTH, HANDBAGS & ACCYS.